Zindagi Tv is a Famous Urdu Entertainment Tv Channel in India . Zindagi tv(Jodey Dilon Ko) is famous for broadcasting Pakistani Legendary Tv Shows in India. Now they are ready to Launch New Tv Serial Titled as " Sasural Ki Galli " in the Month of May 2015. This show is formerly running in Pakistan with the Name of "Meenu ka Sasural" on Ary Digital Tv Network. Latest Show is Written By Ghazala Naqvi and Directed by Zahid Mehmood. 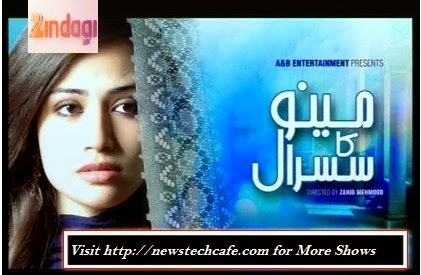 Sana Javed is seen in Lead Role in this show.This show is her Debut Pakistani Serial. The Story of the Revolves around the Marriage Life of Meenu. According to Our Society Marriage may be a life-long sacred bond, one that's molded with love and mutual understanding. But when a relationship is loses all such emotions, conflict arises even between a loving couple. “Sasural Ki Galli” reflects the story of such conflicts within the families that may create extreme distrust and negativity. Sana Javed is in Lead Role in this show .She is Playing role of Meenu in this serial . Be ready to watch this show. You will like Her role in this show. Official Promo of the Show is not declared yet . But we are sharing Title song of "Meenu ka Sasural" here . Listen this nice Title song from this show.